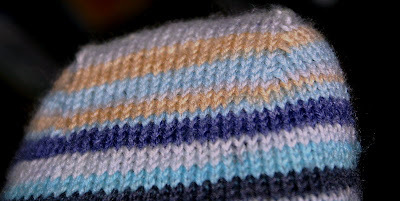 The Yarn: Online Supersocke 100 Tropic-Color no: 927. This is 75% superwash wool and 25% nylon. There are 8 colours in this range and I have all of them-cos I got a really good deal on them. I knitted them with my new Hiya Hiya needles from The Knitting Zone. Love the needles too. I cast on 44sts (22 sts on each needle) Turkishly. On the increase rounds I moved the increase in one stitch every increase row. It gives a wonderful fit. Sherman Heel adaptation as always. i really like the toes on this one! I do not have pointy toes and this looks so comfortable. Wow, that toe is gorgeous. Could you give more detailed instructions? I'd really like to use that in my next toe up pair. Oh, Colin. It's simply spectacualr. I'd love more information on the toe, too. It's simply beautiful. 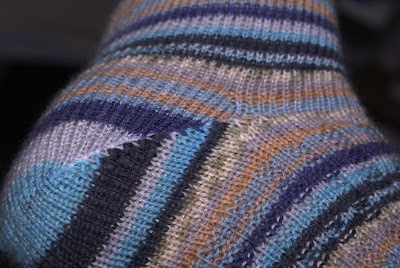 I was going to say what Sarah said, I would love to know how you did the increases, with toe ups I normally knit in front and back of the chosen stitch for the increase. The toe looks good - so good I'd like to try one sometime. Please give some additional details. Thanks so much! Great job once again on the sock. I like the way that toe looks, a bit funny but nice.. :) and does the seams from the decreases not play games on sitting on your toes like that? Now those are colorful!!! I really do like those. I love the way the colors compliment each other...the blues really stand out and smile!!!! Quite possibly, your 'happiest' socks yet!! 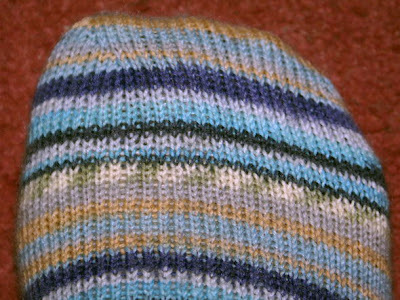 Love your socks.......your knitting is so even. Congratulations on your dogs too. Cool colors. I really like John's socks too. Such a subtle striated effect, really elegant. And the toe on these socks may convince me to actually try toe up. I'm chiming in with the others who want details!